1 December 2012 | Already launched back in 2004, Emirates ‘Knowledge-driven Inflight Service’ (KIS) allows the airline’s cabin crew to see which previous trips a passenger has taken with the carrier before and based on this, know their food, wine and seating preferences, or any issues a customer had during their travels. Pursers use KIS to brief the cabin crew before every flight and check passenger’s special needs, as well as see who is enrolled in Emirates’ frequent flyer programme Skywards in order to enable the crew to provide a more personalized service. Cabin crew can also use the KIS system to perform in-flight upgrades to Business or First Class, as well as post customer feedback that’s emailed to headquarters upon landing. In order to solve the issues with the rather outdated device, as well as further enhance its knowledge-driven inflight service, Emirates just announced it has become the first global customer of the HP’s new ElitePad 900 tablet which runs on Microsoft’s new Windows 8 operating system. According to Kevin Griffiths, SVP of cabin crew at Emirates, the airline tried numerous other devices but was attracted to the ElitePad by its looks, lack of weight and bulk and support for legacy (Windows-based) applications. The ElitePad is 3G enabled and Emirates has airtime agreements in place in most of its 120 destinations, so the tablet is synchronised with the back end applications and loads the final status just before departure, as well as will on landing. 6 September 2012 | In order to improve the passenger experience at the airport, Tokyo Narita International Airport recently rolled out a number of customer service initiatives as part of its ‘i-Airport’ strategy. Following earlier initiatives at Madrid Barajas and Singapore Changi airports, Tokyo Narita recently equipped roving help desk staff patrolling the airport’s Terminals 1 and 2 with iPads to provide passengers with real-time information on-the-spot. In addition to flight details, train and bus schedules, details of local hotels and lost and found information, the devices also let mobile agents provide guidance using digital maps of airport facilities and retail stores. Six iPads are currently in operation and Narita says it is using the tablets to complement the ‘traditional’ airport’s information counters. In order to enable service agents to respond to Chinese and Korean-speaking travellers in their mother tongues, the customer service iPads also have the airport’s new NariTra language translation app installed. Launched by Tokyo Narita in early 2012 – and available for free download in the iTunes App store and Android Market – the NariTra app translates standard travel phrases as well as spoken phrases into English, Japanese, Chinese, and Korean. In addition to the language app, Tokyo Narita in June 2012 also launched a ‘mobile wayfinding’ app. A ‘low-tech’ way to overcome language barriers are “I Can Speak a Foreign Language” badges, which retail staff at Narita have been wearing since April 2012. The colourful badges allow travellers to tell at a glance if a clerk can speak a language other than Japanese or English. 23 July 2012 | Following recent initiatives by British Airways, KLM, and SWISS, Spanish flag carrier Iberia has just announced it will equip its 600 pursors with iPads in order to help cabin attendants anticipate passengers’ needs and offer a more personalised and higher quality service. Iberia says the application will gradually incorporate additional data, such as descriptions and pictures of the meals available on the flight, and information of interest to passengers, covering hotels, restaurants, consulates, embassies, etcetera. Pursers can use their iPads to change seat assignment, and the device will also store duty manuals for crew members, formerly available only on paper. A video of Iberia’s new iPad-based onboard service is available here. The introduction of the iPad for pursers is one of several initiatives that are part of Iberia’s Ágora program, which has been launched by the airline to improve customer service, punctuality, and operational efficiency. In early 2011, Iberia equipped customer service staff at its Madrid-Barajas hub with iPads that provide them with real-time access to operational information so they can make decisions and keep passengers informed in a better way. Tablet PCs are also used in the daily servicing of the ground handling vehicles used by Iberia at Madrid-Barajas. While the IBPad initiative focused on providing Iberia ground staff with real-time information, the airline has also just launched a new initiative called ‘IBHelp’ as an extension of the IBPad-based customer service. More than 100 Iberia customer service agents will be equipped with iPads and PDAs loaded with applications enabling them to deal with a wide range of customer incidents and requests in real-time and from any location within the airport, making them more proactive and mobile. To implement IBHelp, Iberia has developed an check-in platform called ‘Departure Control System’ to link the mobile devices to all check-in kiosks and Quick Service Points from which documents may be printed. According to Iberia, in addition to making customer service more flexible and agile, the objective of IBHelp is to optimise customer service resources at peak times (video here). 22 April 2012 | Last year we covered a new in-flight entertainment concept called TrayVu, developed by Seattle-based Skycast Solutions. 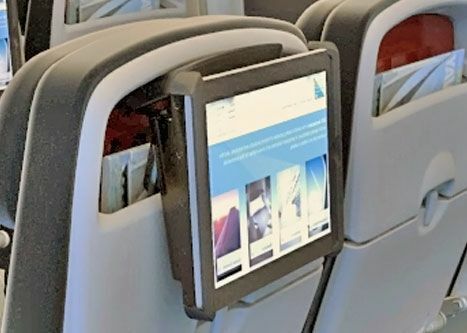 The initial design of the TrayVu, launched in October 2011, combined the meal tray and the IFE system into one, while a hole cut in the tray allowed the display to still be viewed when the tray table is put in an upright position. Canadian low-cost airline WestJet has now become the first carrier to install the TrayVu IFE system on its new B737-800, albeit in a somewhat modified design. Instead of being fully integrated into the tray table, the so-called TrayVu ‘Slim’ system can be clipped onto the back edge of the seat back tray so that the tray surface remains free for food and beverages. Starting in June the TrayVu Slim IFE tablets will be deployed on WestJet’s two new Boeing 737-800 aircraft, with the tablets coming to another two WestJet 737s by the end of 2012. WestJet currently offers live TV on its fleet of 737 jets, but Greg Latimer, Skycast’s chief marketing officer, said the airline has taken its latest 737-800 direct from Boeing without any IFE system and intends to offer the TrayVu tablets, 68 of which will be available on each aircraft. Skycast has not yet settled on a rental fee for the tablet, but says that it will be in the region of CAD10 to 15. SkyCast’s Latimer reckons that although as many as 85 to 90 percent of passengers could bring their own iPad, Kindle or some other portable electronic device aboard longer flights in the future, Skycast hopes that the so-called early window content – latest release movies and TV shows — available on the TrayVu will persuade many of those passengers to rent a portable device. WestJet says it will evaluate the success of the TrayVu Slim portable IFE programme, and based on the results, will decide on possible expansion. 27 August 2011 | We recently published an overview of how airlines and airports around the world have made Apple’s popular iPad device available to passengers in their lounges, rent them out in the air, or use them as self-service kiosk, customer survey tool, and food ordering tool (see: “11 ways how airlines are deploying the iPad”). In the past week several new initiatives have been announced by British Airways, KLM and Changi Airport, using the device to improve customer service on the ground and in the air. British Airways has just equipped its cabin crew with iPads to enable them to have prior awareness of customer preferences and a greater understanding of each customer’s previous travel arrangements, allowing them to offer a more personalised service. The iPad lets BA crew identify where each customer is seated, who they are travelling with, their frequent flyer status, any special meal requests, as well as customer service updates. The latter means that any issues can be logged with ground-based colleagues around the network prior to departure, so solutions can be delivered while the flight is airborne. When all the passengers have boarded and just before the doors are shut, cabin crew are currently handed a long scroll of paper, listing up to 337 customers. With the new iPads cabin crew will simply refresh their screen when the doors have closed through wireless 3G networks and they will have a complete list of passengers on board. The iPad is currently being trialled with 100 cabin crew with the aim to roll it out to all 1,800 senior crew members across the airline in the coming months. More images here. On a similar note, KLM will provide a group of 50 senior pursers with iPads on board as part of a 6-month trial project starting in October 2011. KLM says it feels it is essential that cabin crew have easy access to the latest information in the air, as personal contact with passengers on the ground is becoming rarer due to the increased deployment of self-service kiosks. As part of the same ‘pilot’, KLM will also equip 50 pilots with iPads, providing them with an extra tool during flight operations that is more efficient than the large volume of forms, briefing documentation and manuals they usually take along. The iPad, which began primarily as an entertainment device when it was launched in 2010, has captured the imagination of many other industries in ways that Apple never even imagined. We have reported several times on airlinetrends.com how airlines have made Apple’s versatile iPad device available to passengers in their lounges, rent them out in the air, or use them as self-service kiosk, customer survey tool, and food ordering tool. As the list of applications continues to grow, here is the latest overview of how airlines and airports are deploying the iPad worldwide. Cathay Pacific in July 2010 became the first airline to launch a dedicated application for the Apple iPad that lets users book Cathay Pacific flights, manage their flight booking, check the status of their flight, and check-in. Similar apps are today offered by American Airlines, Malaysia Airlines, THAI, and Alitalia. In June 2010, Malaysia Airlines, in cooperation with SITA, introduced the world’s first airline kiosk that uses the iPad. Passengers can use the ‘MHkiosk’ to search and book flights and check-in online. The kiosks are installed at the airline’s ticket office at Kuala Lumpur’s central station. Spanish airline Iberia has equipped customer service staff at its Madrid-Barajas hub with iPads to provide them with real-time access to the information they need to make decisions and to keep passengers informed. Iberia’s so-called IBPad is loaded with 30 different applications which, according to the airline, together put the entire airport in the palm of the employee’s hand. Iberia says the IBPad has improved everyday operations and dealings with customers, boosting communications and staff decision-making autonomy, while eliminating the use of paper. Since March 2011, so-called Changi Experience Agents (CEAs) have been walking the grounds at Singapore Changi Airport, assisting passengers with special needs, and helping passengers with wayfinding at the airport. Locating missing luggage, facilitating passengers with check-in needs and assisting transit or transfer passengers with their onward connections also form part of the CEAs’ duties. Each CEA is equipped with an iPad with which they can retrieve information, such as the latest flight updates, store location, check-in gates, etcetera. The CEAs are on duty all day except from 1am – 6am when passenger traffic is low. 22 May 2011 | Delta Air Lines and airport restaurateur OTG Management have announced a new concept at Minneapolis-St Paul Airport (MSP) that taps into two major consumer trends: a growing interest in local and healthy food and the popularity of personal digital devices such as the Apple iPad. At its Concourse G terminal at MSP Airport, Delta will upgrade its current food and beverages offerings with 12 new local restaurants and several fresh food markets. Chefs from the ‘Twin Cities’ will work with local farmers and producers to create a sustainable, health-conscious approach to dining. Restaurants will include Custom Burger – which uses regional farm-sourced meats – a Minnesota Beer Hall serving locally produced beers and Cibo Gourmet markets that emphasize local and artisan foods. 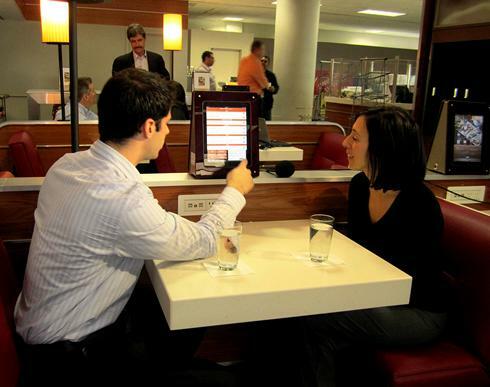 Similar to the food ordering concept introduced by Delta and OTG at New York JFK and La Guardia airports in late 2010, passengers at MSP Airport will be able to order their food and drinks at seating areas equipped with iPads located at the gates and have their orders delivered to their seat. Delta and OTG will also introduce the OTG Media Bar, a virtual newsstand where Delta passengers can rent an Apple iPad, loaded with the content of their choice. The devices will be available at Cibo Gourmet markets located through the terminal and customers can download publications, movies, music and apps to enjoy during their flight. Those with their own iPads will be able to download material as well. Once the passenger reaches his or her final destination, a pre-paid postage box received at time of rental is used to return the iPad. This concept of returning rented goods via the mail has been popularized in the U.S. by DVD subscription service Netflix in recent years. 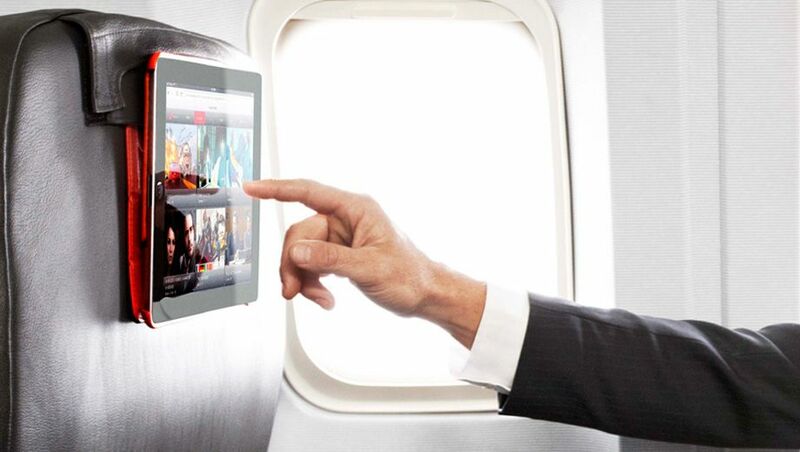 1 May 2011 | Much has already been written about the in-flight rental of the iPad by airlines such as Jetstar, Iceland Express and airBaltic. In June 2010, Qantas low-cost subsidiary Jetstar became the first airline in the world to offer the iPad for rent in a month-long trial on two routes out of Melbourne. Iceland Express was the first airline to introduce the device for rent on an ongoing basis in November 2010 (on transatlantic flights), while airBaltic just confirmed it will make the latest version of the device, the iPad 2, available for rent in-flight from early June 2011 on. Initially planned to be rolled out by year-end 2010 across its fleet, but this was reportedly delayed due to contract negotiations with Apple and media outlets, Jetstar is about to roll-out the iPad as its main source of in-flight entertainment. Although no firm date has been announced yet, Group CEO Bruce Buchanan in the April 2011 edition of Jetstar’s in-flight magazine says that the introduction of iPads is ”imminent”. Jetstar’s iPads will include a novel feature. 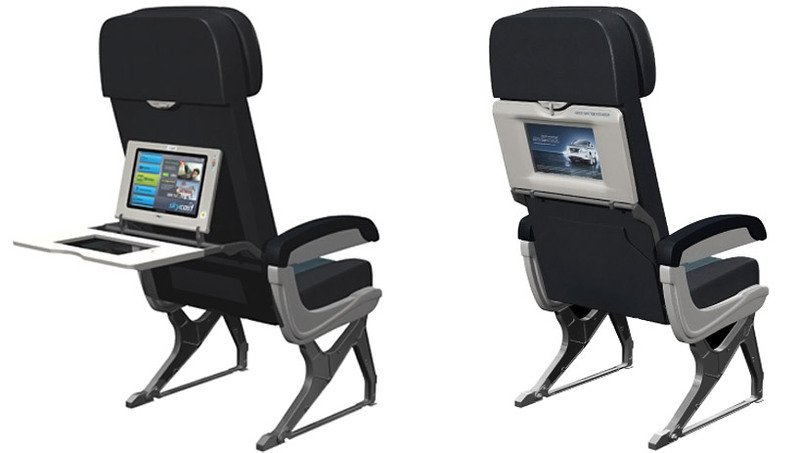 Flightglobal and Australian Business Traveller report that Jetstar will fit the iPads with a purpose-built case which includes a bracket that lets passengers hang the device at eye level on new ‘Pinnacle’ slimline seats from B/E Aerospace. The seats will come installed on Jetstar’s new A320s (of which it has 44 on firm order) and the airline will also retrofit around 25 aircraft with the new seats during 2011. B/E Aerospace has relocated the literature pocket to the top of the Pinnacle seat, which freed up more leg room and allows the iPad case to be clipped backwards onto the seat pocket at eye level. Alternatively, a flip-stand on the case lets passengers rest the iPad horizontally on the seat’s tray table. See this video demonstration for more on the workings of the iPad case. 11 February 2011 | Apple’s versatile iPad is currently being used by airlines as inflight entertainment device, self-service kiosk, customer survey tool, or as a food ordering tool. Now Spanish airline Iberia has equipped its customer service staff at its Madrid-Barajas hub with iPads that provide them with real-time access to the information they need to make decisions and to keep passengers informed. Iberia’s so-called IBPad is loaded with 30 different applications which together put the entire airport in the palm of the employee’s hand. Constantly updated with real-time information from Iberia’s Barajas Hub Control Centre, the IBPad enables agents to access a wide range of up-to-date information. Iberia says the IBPad will improve everyday operations and dealings with customers, boosting communications and staff decision-making autonomy while eliminating the use of paper. See here for a video of the IBPad functionality. – Information on passengers at risk of missing connecting flights and their status as customers. – Information on passengers on intercontinental flights that have not yet checked-in. – Flights at risk of being delayed or cancelled and any other incident that would impact on customers. – The list of passengers on each flight who need assistance. – List by departure zone of the status and progress of boarding procedures. – Baggage remaining to be loaded on each flight, with passenger name. 3 December 2010 | Delta Air Lines and airport restaurant operator OTG Management have just launched a novel restaurant concept at New York JFK Airport. Rather than make travelers leave their departure gates to go to a restaurant, Delta passengers can order food and drinks via a custom application on one of 200 Apple iPads installed at dining areas near the gates. A server then delivers the food to the customer’s seat. Food can also be taken to go or brought onboard. Prior to completing their order, customers using the new dining stations will be informed of their meal delivery time to ensure their order is received before their flight departure time. The orders will be delivered by OTG servers in approximately 10 minutes or less. The iPads are affixed to the booths and counters at the gates and also offer other applications that allow travellers to check flights, read articles, play games, etcetera. OTG says the wireless Internet connection for the iPads is free, there isn’t a time limit on customers’ use and travelers don’t have to buy food to use the devices. The newly designed gate dining areas accommodate single and group travelers with most seats also outfitted with power outlets for charging electronics. The iPad dining stations located at JFK’s Terminal 2 (gates 21 and 22) feature food from Croque Madame, a French-inspired dining concept developed by Michelin Star-winning chef Andrew Carmellini from New York, while Terminal 3 (gate 15) offers cuisine from Bar Brace, an Italian dining concept from New York restaurateur Jason Denton. The chefs composed their respective restaurant’s menus and will continue to consult on the eateries.